Moving from hairdressing to the world of pastries is an interesting transition, what ignited your change of career? I have always been super creative. Coming from a world where I had being doing hairdressing for over 13 years, I felt it was time for a change. Watching cooking programs like Master Chef religiously made feel like I could make it a reality. If they could be picking up a knife or tools in the kitchen then so could I! I was approaching the age of 30 and thought, do I really want to be hairdressing forever? I realised the answer was no, and packed my bags and off I went to study to become a pastry chef. I studied full time for 2 years and at the end I was a fully qualified pastry chef. There has not been one day where I have missed hairdressing, I love what I do now and I wouldn't change it for the world!!! What would you say was the biggest surprise when it came to shifting your focus to a full time entrepreneurial role? It has definitely has been a hard task. I have gone from being an amazing chef in the kitchen and creator of beautiful designs, to learning how to run a business. I have had help from some amazing people around me, helping me with my website, how to understand analytics, accounting, you name it I have been there asking anyone and everyone for their knowledge to help me along the way. I would say the biggest surprise has been realising that I CAN do this! If I don't learn how to then the business will fall down around me. Determination is key. I will do everything I can to make this business work and be a success. What were elements of starting your own business that didn’t meet expectations i.e. growth of your brand awareness, the time you have to dedicate to building this brand? I feel like the most difficult thing for me was how do I make people aware of my cakes and brand when I didn’t have money for things like advertising or PR. I watched these cake makers with followings of over 200k when I first started, and always compared myself to them, and I thought to myself how is this even possible? In the beginning it was about aligning myself with particular brands or influencers, creating ALOT of cakes for free, to get my name out there. I am always about making things happen and therefore I wanted them to happen yesterday. I have realised that things take time and I have to be patient. I spent all the possible time I had, if I wasn't in the kitchen cooking, I was spending time thinking how can I make myself busier? I was out on the ground meeting fellow people in the wedding industry, offering my help to them in any way I could, building relationships and trust. I have offered myself to an abundance of wedding industry nights and wedding fairs. Figuring out what worked and what didn't work and learning from my mistakes. When it comes to being solely an e-commerce business, is it harder to obtain credibility in the industry and achieve cut through with new customers, in comparison to competitors with store fronts? I think you just need to keep your product easily accessible. You have to put a lot of time into still being able to offer the client tastings or meetings, or an opportunity to meet. A lot of people still want to be able to see the product, to feel the product, to taste the product before they spend their money on an event like a wedding- which I can totally understand. 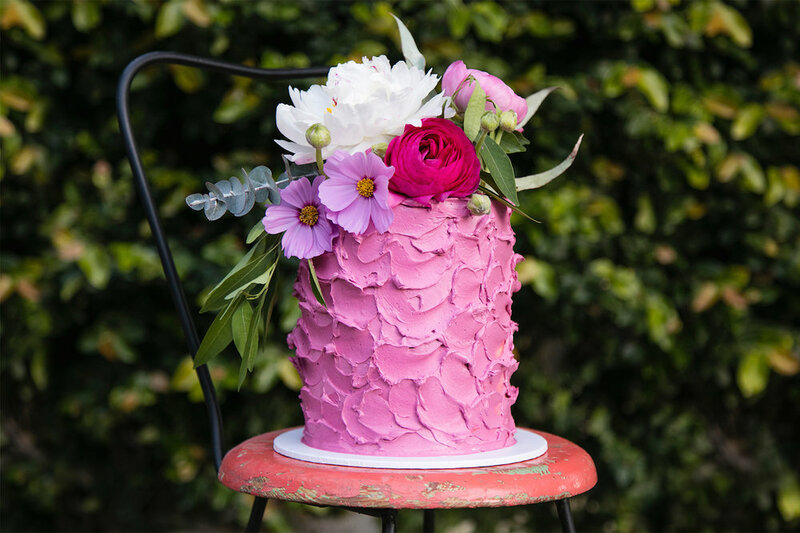 We offer cake meetings which is a good opportunity for us to meet face to face and go over any questions you have in regards to your cake for your event. We also offer tasting boxes, which include samples of all of our flavours to try. Offering the above options I think is all people want. If you offer this I think once you meet face to face they have the confidence in you and the product and they are happy and in turn, become repeat customers. How would you say social media has pushed your brand to the consumer, and why it is important to utilise all elements of it? Social media has made the product easily accessible for people all over the world. You could be living in London and getting married in Sydney, all you need to do is use a hashtag like #sydneycakes and you will get noticed. You don't need to be an incredibly established brand for this to work. If people are using search engines for the above it is likely the small guys won’t get noticed, so using hashtags are incredibly important. Posting regularly is also great. I find myself posting at least twice a day. It gives a great opportunity for people to share your work as well, whether it's tagging a friend to take a look, taking a screen shot of an image, or even sharing your images with their followers is incredible. Social media does take a lot of time out of your day but it is so worth it!